In the year 2009 we are celebrating the 100th anniversary of the Italian Chemical Society, the scientific association to which about 5000 chemists subscribe; they operate in Italy within Universities, Scientific Research Councils, Schools, Industries. In this same year we are also celebrating the 100th anniversary of the definition of pH, quantity also a known to the laymen, and the 25th anniversary of the Chemistry Games a competition among high school students which, born in Padova, but is now held nationwide with about 30000 students participating to the national finals. To celebrate these recurrences, chemists organize from August 31 to September 4 an International Congress The Centenary where to discuss problems of general interest (job opportunuties for young people after the University degree, the industrial settlement in Marghera and the problems with the community, the pollution in the Venetian Lagoon) and other issues more specifically connected with chemistry (pH in food and wine, chemistry and cultural heritage, the Chemistry Games, etc.). 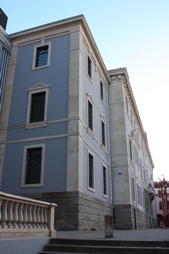 The Congress will take place in the Centro Culturale Altinate-San Gaetano, in Via Altinate in Padova.